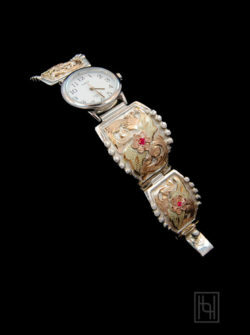 With curved sterling silver plates for a comfortable fit, the Ladies Decorated Watch Band – White/Silver Rim Face w/ Crystal Clear – Silver is a customer favorite! This sophisticated piece boasts intricate layered scroll work. Rose gold flowers with green gold leaves hold accent stones. Silver beads complement a Timex watch face; one of America’s most trusted time keepers. Fits wrist sizes 6 inches to 7 inches. Special orders for metal and stone color options are available. Special orders for sizing are unavailable. Sterling Silver with 1/10 10k & 14k Yellow Gold, Rose Gold, & Green Gold with Crystal Clear Cubic Zirconia.